EyeMed realized that inconsistency was keeping a great B2B brand from reaching its full potential. They had started to implement their newly-tightened brand, but the strategy behind the guidelines was getting lost in translation. They wanted something that was easier to execute and easier to depend on. The structure we built shows the strategic value of being involved from the very beginning, and seeing it through to the end. 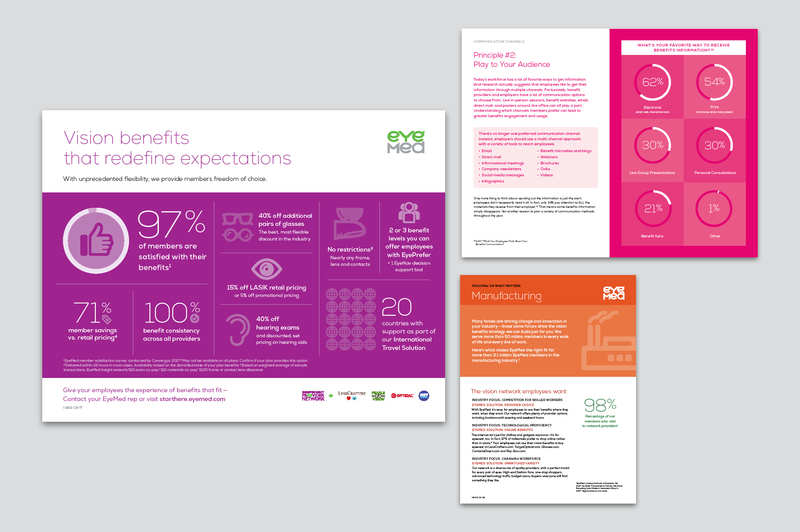 The existing EyeMed brand had strong roots, but we first needed to clean up some weeds within the existing templates. 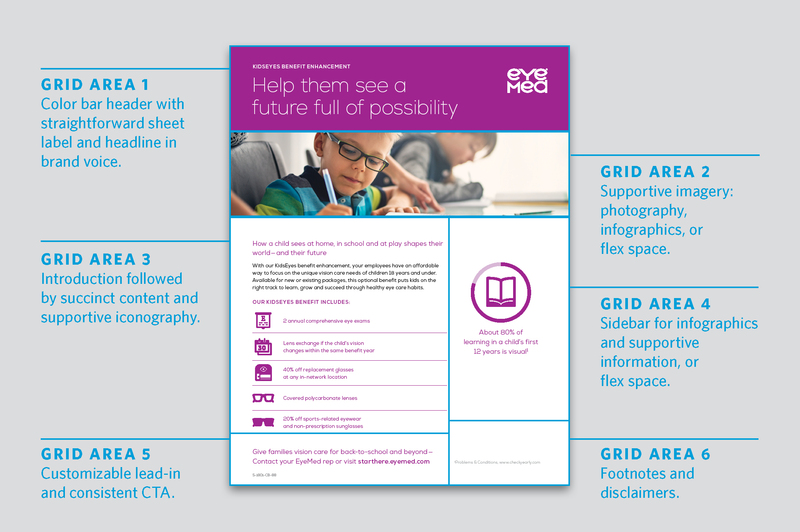 We advanced the guidelines by formalizing new standards for photos, data, logo usage, graphic elements, language and messaging. Working with the team at EyeMed and a deep knowledge of their overall strategy, we constructed a small but mighty set of clear guardrails. 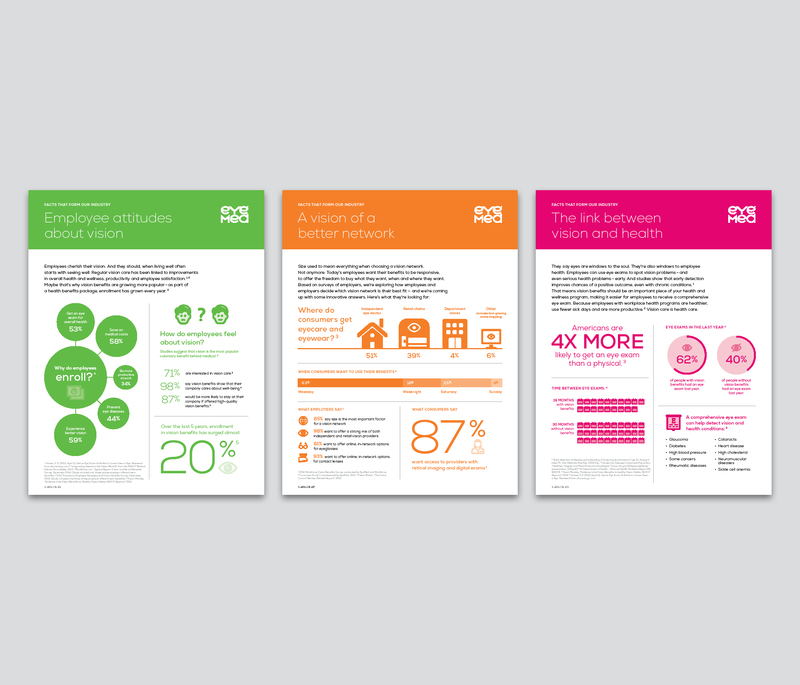 To put the brand to work, we started with a collection of product, service and benefit one-pagers. Because we nailed down the foundation, we knew the constraints and (ironically) were able to discover opportunities for freedom. Here, the brand’s flexibility starts to flex its muscles. Each sheet doesn’t look exactly like its siblings, but people can tell they all belong to the same family. By simplifying and streamlining, strategic gaps began to show themselves. Soon we were branching out, exploring a more personal side of insurance, and discovered a gap in data storytelling. Can imagination and consistency coexist—even make each other stronger? We think they can. We continued to evolve what was brand-ownable, what was differentiating and what tied it all together. Now that the brand system was clean and firm, the period of contraction was over. It was time to re-expand the brand possibilities and apply it to different formats and types of content. Guides, whitepapers, emails, direct mail and more were quickly added to the system. In all, we designed more than 150 pieces that all fit together without looking stale or repetitive. 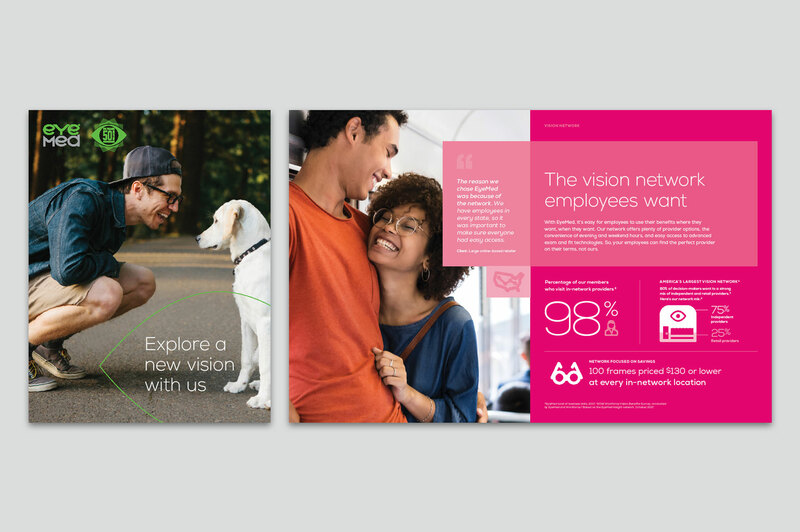 Everything came together in a custom-designed core brochure. All the tools, all the concepts, all the elements, rules and standards. 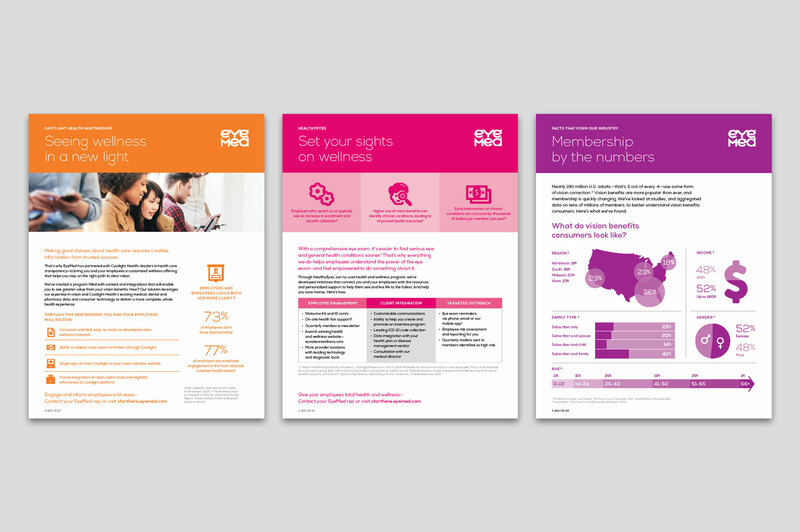 Brand guidelines are more effective when they’re put to the test in the real world of actual content. When a brand team is also forced to confront the realities of implementation and “prove their theory,” your results are strategic and your guidelines are sustainable.